A California woman who claims she saw Sasquatch perched in a tree last year is suing California for refusing to accept what she now knows to be true: Bigfoot inhabits the San Bernardino mountains. Claudia Ackley—who has been researching Bigfoot for the last two decades—was hiking with her two daughters, aged 11 and 14, near Lake Arrowhead last March when her children became paralyzed with fear, Ackley told local news outlets. At first Ackley assumed they had seen a bear, but she then observed what appeared to be an approximately 800-pound creature resembling a hairy Neanderthal just a few yards away, about 30 feet up in a tree. Once she and her daughters were safe, Ackley called authorities to report the Sasquatch sighting, but they insisted she had seen a bear. That denial inspired Ackley to file a lawsuit against the California Department of Fish and Wildlife and the state Natural Resources Agency last month, accusing California of dereliction of duty for failing to protect Bigfoot and infringing on her constitutional rights. Today, we are proud to share that lawsuit with you. Ackley’s petition makes some valid and interesting points, starting strong with an introduction that invokes esteemed conservationist President Theodore Roosevelt. 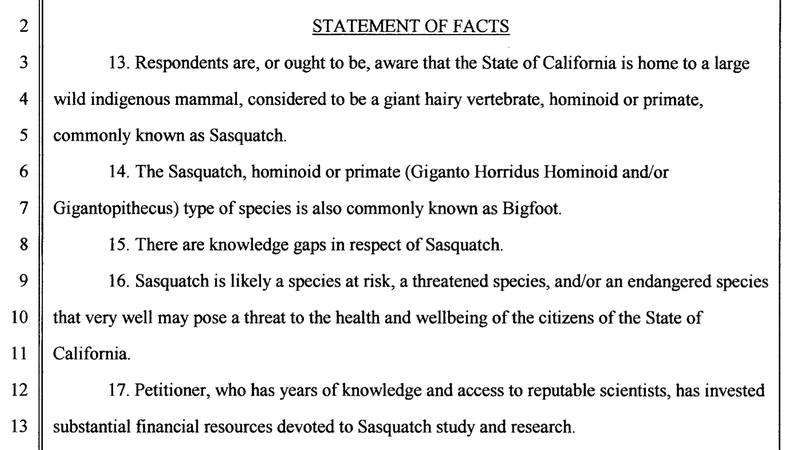 The petition then continues to a statement of facts, which includes some strong points about Giganto Horridus Hominoid, the “hominoid or primate” that is “commonly known as Bigfoot,” that are difficult to disagree with. But the real victims here are Ackley and others like her that want to educate others on the existence of Sasquatch. While Ackley’s lawsuit doesn’t offer any specific proof of Bigfoot’s existence, she reportedly intends to submit a mountain of evidence in court to support her case, including testimony from “wildlife biologists, wilderness experts, and police forensic officers.” Additionally, one of her daughters captured a video of what she saw. The video, which was included in the local ABC news segment, shows what appears to be trees and shadows. What&apos;s the Most Absurd Big Foot Photo You&apos;ve Ever Seen?